The Weaver Group Realty Inc. If Seclusion and Privacy is what you desire, take a look at this 2.5 Acres with private drive from Drew St., Brooksville. 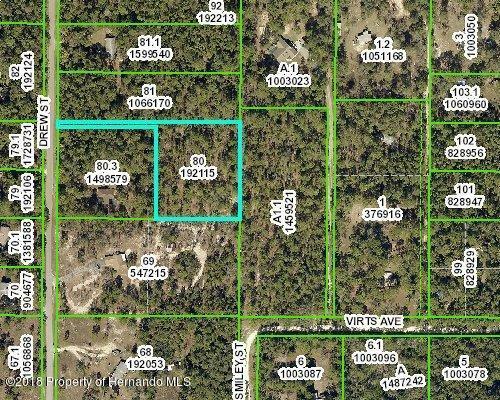 Lot is located behind 6190 Drew St. Easy access to the Suncoast Parkway, shopping and Tampa. At one time this property had a structure on it so there was electric, natural gas and phone service access. Great location and zoned AR2 (Agriculture/Residential) so you can build your dream home, farm and raise some animals/chickens. AR2 zoning allows for single family homes or mobile homes. As well there are special uses allowed:i.Home occupations; ii Bed and breakfast establishments; iii. Animal Specialty Establishments.